Barrie line, between E. Gwillimbury and Bradford. This change will make the 15-year plan for Regional Rail (full day, 2-way) service consistent with the core network identified in GO2020, and identifies the sections of corridors noted above as Regional Rail peak period only. This change is also consistent with current phasing plans for all day service. In the description of the Air Rail Link in the list of Top 15 Transit Priorities, add the word "electrified." This reflects the recommendation of the GO Electrification Study, and the phasing plan of that study: electrify the Airport Rail Link first, before electrifying the GO Lakeshore line (also a top priority within The Big Move) and the balance of the Kitchener corridor. Move the GO Bolton line from the 15-year plan to the 25-year plan. This reflects the findings of the 2010 Bolton Feasibility Study which concluded that 2031 ridership was very modest in relation to the very high capital costs required to initiate the service given the need to double-track the corridor. Move the GO Havelock line (Union to Locust Hill in Markham) from the 15-year plan to the 25-year plan. Due to very modest ridership potential and significant infrastructure and operational challenges related to the Agincourt rail yards. Advance the eastern section of the "Downtown Core" rapid transit line (a.k.a. 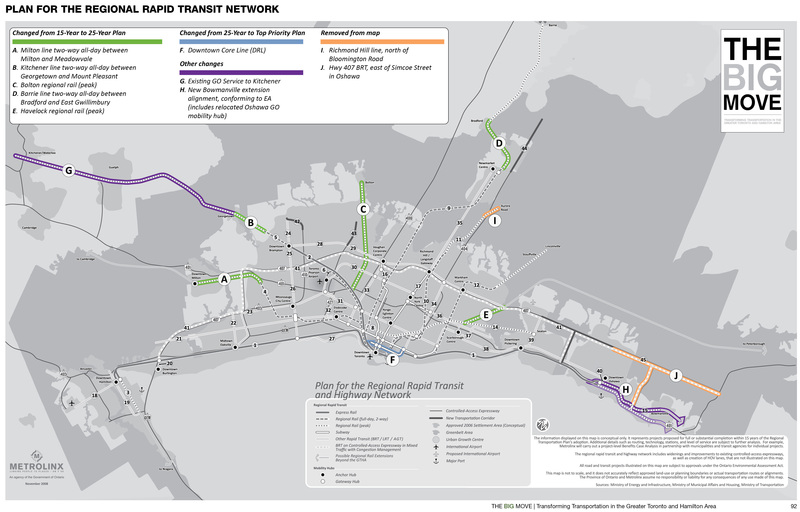 Downtown Relief Line) from the 25-year plan to the 15-year plan and the Top 15 Transit Priorities. This change reflects analysis on the capacity constraints of the Yonge subway reported in the TTC's Downtown Rapid Transit Expansion Study (DRTES). Further study, including transit network considerations, is required before the scope and alignment of this project are decided. Make the Richmond Hill extension slightly shorter, terminating at Bloomington Rd. instead of Aurora Rd. This reflects the conclusions of the 2009 Richmond Hill Rail Service Extension Environmental Assessment. The proposed Aurora Rd. station was listed as "not preferred" due to a number of environmental factors. A station at Bloomington Rd. will offer adequate access to drivers on Highway 404. Move the Oshawa GO mobility hub to the proposed new location identified in the approved Environmental Assessment on the CP Belleville subdivision, north of the 401. Update Big Move #8 - A Comprehensive Strategy for Goods Movement - to incorporate the five strategic directions and supporting actions identified in the GTHA Urban Freight Study (received by the Metrolinx Board of Directors in February 2011), as well as note coordination with the Ontario Multimodal Goods Movement Strategy that is currently in draft. The overall objective is to revise Big Move #8 to reflect the strategic directions adopted by the Metrolinx Board, rather than only the need to "develop a comprehensive goods movement strategy." Focus this chapter on the June 2013 release of a new Investment Strategy, while retaining section 6.1 "Costs of the RTP". The "Costs of the RTP" section 6.1 and the box containing Big Move #9 will be retained by merging it into Chapter 5.0 "Looking Ahead." Anticipating the Metrolinx Investment Strategy in June 2013, the remaining parts of this chapter would be out of date at that time. Hence sections 6.2 - 6.4 are revised to ensure co-ordination with the upcoming Investment Strategy. Add discussion of transit project prioritization to section 7.2.2. Metrolinx has adopted a prioritization process that was not contemplated in detail in 2008. Show existing GO services to Kitchener in the maps similar to the portrayal of services to Barrie. In 2008, this was a potential service outside Metrolinx's jurisdiction. Today, the service is in operation. Remove GO 407 bus services in Durham shown running from Simcoe St. to Highway #35 / 115. Update the GO Lakeshore East Oshawa/Bowmanville route to reflect the Environmental Assessment recommended alignment. 9.1 Develop a comprehensive strategy for goods movement within the GTHA, and between the GTHA and other regions, that identifies opportunities and actions to improve efficiency, increase capacity, enhance the region's competitiveness, and reduce emissions of GHGs and other pollutants. Build collaboration and support by strengthening and collaborating with multi-sectoral forums; establishing an inter-governmental freight committee; and improving and coordinating public outreach on urban freight, particularly with Provincial and municipal goods movement strategies. Improve urban freight information by strengthening data sharing on freight vehicles, routes and activities; and establish a GTHA urban freight data collection program. Increase transportation network efficiency for goods movement by developing and protecting a strategic GTHA truck network; harmonizing truck route standards and mapping; investigating intelligent lane utilization and truck-only lanes; and exploring opportunities to move freight on transit. Enhance planning and development by establishing freight-supportive land use guidelines; supporting development of innovative freight hubs; improving access to existing intermodal facilities; and planning and protecting complementary land uses near major freight hubs. Improve operational practices by using technology to optimize and manage the movement of goods; exploring opportunities for flexible freight delivery times; enhancing incentives to encourage off-peak deliveries; and implementing reserved curbside delivery options. Collaborate with MTO to develop and implement the Ontario Goods Movement Strategy. An Investment Strategy to provide immediate, stable and predictable funding. Adopt the Metrolinx Investment Strategy to begin providing stable and predictable capital and operating funding to support the implementation of the RTP. Consistent with Metrolinx legislation, Metrolinx is recommending a sustainable funding strategy that will ensure the regional transportation plan, The Big Move, is implemented. World-class regional transportation authorities have suitable revenue sources to fund transportation. A global survey of leading transportation service providers demonstrates that funding through diverse, dedicated sources provides the certainty needed for efficient long-range planning and sustained network and service expansion. Leading regional transportation authorities also have a mandate to invest in all aspects of the transportation network - walking, cycling, transit, and cars - to seek the optimum investment; recognize the needs of different system users; and address the number of trips involving multiple modes. Once implemented, an Investment Strategy will provide the GTHA the opportunity to join leading city regions across world where population growth is matched by appropriate, efficient improvements to transportation. Metrolinx's investments to date reflect the "results-first" imperative repeatedly emphasized by the public and stakeholders during consultations held by Metrolinx since its formation in 2006. Phase one of investments saw $750 million in existing government revenues devoted to "Quick Wins" projects that financed quickly implementable service improvements across the GTHA. As a result of the "Quick Wins" funding, new subway cars and the first phase of a signal system to allow for more trains running closer together on the Yonge-University Subway in Toronto, and improved bus services across the region are in service. Subsequent investments through Metrolinx saw new major projects announced, for a total of approximately $16 billion in public resources committed by governments to larger-scale transit projects currently under construction. Projects include new subway, new underground and surface light rail transit, new rapid bus transit systems in Mississauga, Brampton, and York Regions, regional GO rail improvements, the new Union-Pearson Airport Rail Link and improved infrastructure on the Georgetown corridor, and major improvements to Union Station, the heart of the regional transit network. These projects will soon be entering service, improving access to employment, housing and services for residents throughout the GTHA while establishing Metrolinx's implementation credibility. Together, these early investments represent one of the largest urban transportation investments in Canadian history. Government funding of this magnitude has enabled Metrolinx to break ground on transformational infrastructure projects that will provide new transportation options and congestion relief to existing corridors - all without seeking any new revenue sources and financial tools. However, investment of this magnitude must be sustained over the long term. Governments can't be expected to sustain this level of record investment in the current fiscal environment. The Metrolinx Investment Strategy proposes new revenue tools, implemented responsibly, to provide consistent, dedicated funding for transportation over the longer term. The proposed revenue tools will align with several design principles drawn from the best practices of successful regional transportation authorities across the world. The Investment Strategy will reduce planning and budgeting uncertainty by diversifying Metrolinx revenue streams and match long term planning to long-term budgeting and investing. The resulting predictability will mean that not only will Metrolinx be able to better implement its capital plan but also budget effectively for the operations, maintenance and rehabilitation costs. It is important to note that large capital projects generate benefits for all levels of government; and therefore specific large projects and programs will require support from all levels of government, in addition to new dedicated and predictable revenues. Increased fiscal responsibilities must be matched by transparency, accountability and effective decision-making. Decision-makers will be accountable for the ways in which revenues raised are spent. Project evaluation methods and investment prioritization will be continually refined and continuous information about decisions and the information supporting those decisions made available to the public. Together these measures will help to match the region's expectations for improved mobility with Metrolinx's methods and resources for implementing its transportation plan. Metrolinx will deliver on the public's expectation for excellent decision-making, leadership, transparency, and accountability. The RTP capital and operating program is one of the most ambitious transportation programs in Canadian history. To see this program through, construction costs must be spread out using responsible long-term debt. Metrolinx will use debt appropriately and responsibly. Like a mortgage on a house, using long-term debt to finance major infrastructure enables the financial burden of that project to be paid by present and future beneficiaries, meaning people can benefit from the facility sooner. Additional revenues required will increase over time to better match the improved service people will experience. Capital expenditures are also subject to the capacity of construction contractors and engineering firms to meet the labour and expertise needs entailed by the different projects. Labour and equipment shortages or the lack of enough engineering and design firms can raise construction costs and delay project completion dates, ultimately pushing the full realization of the RTP further down the road. Market readiness and the availability of skilled labour will therefore be an important consideration in the investment profile and system expansion will have to be scheduled accordingly. Metrolinx is already working closely with Infrastructure Ontario, in particular, to manage the capacity of the market to deliver this historic infrastructure build program. Metrolinx will continue to plan for and advance all projects, taking into consideration that implementation timelines for some projects are significantly longer than others. Aside from upfront capital expenditures, the Investment Strategy will be implemented taking into consideration the need to support the ongoing operations, maintenance and rehabilitation costs of new and existing infrastructure. Furthermore, the benefits and costs of infrastructure and service improvements will be traded off to maximize efficiency in getting the best transportation system for each dollar invested. Each RTP project will be implemented using a procurement model that maximizes the ability of Metrolinx to implement projects, ensure value for money and limit exposure to project risks. It is assumed that in each case, private sector involvement in project design, construction and financing will be considered, wherever appropriate. According to Province of Ontario and federal government requirements, all large transit capital project proposals must be submitted for Alternative Financing and Procurement (AFP) evaluation, and AFP will be used where value for money is demonstrable. Operating, rehabilitation and debt service costs resulting from ownership and control will be managed both on a program and project-by-project basis. Asset ownership and management will continue to evolve to reflect best practices. A complete asset management system will be put in place to optimize the use and management of capital assets. Continuing current Metrolinx practice, maximizing the use and value of current assets will be pursued wherever possible. Metrolinx is already pursuing land value capture and other non-fare revenue strategies to raise revenue to fund the expansion and operation of the current and future system. Excellence in asset management and the pursuit of continuous business development is and will be a hallmark of the regional transportation system.